One of the most successful hedge fund managers in the world attributes his success to a daily meditation regimen. "I've been doing it for 44 years, twice a day for 20 minutes," says Ray Dalio, the guru behind Bridgewater Associates, speaking at Tuesday's NYTimes Dealbook Conference. "It's such a great investment ... more than any other factor in my success. It opens up the two sides of the brain, brings a creativity and open-mindedness." He adds, "It allows you to clear your head and bring an equanimity to everything." %VIRTUAL-article-sponsoredlinks%His meditation regimen has inspired other Wall Street celebrities, including Daniel Loeb and New York Times columnist Andrew Ross Sorkin, who said he meditated the night before Tuesday's conference to calm his nerves. He would not invest in Bitcoins right now, though he says the idea has "a lot of merit." France is on the verge of being the next basket case of Europe. "As debt rises faster than income, which is continuing in France, there is going to be a rise in debt service payments, and those are going to have a constricting nature on the economy. ... It puts France in the category of southern European countries." Though the Fed has done a "masterful job" at providing liquidity in the wake of the financial crisis, Dalio believes that the Fed's emphasis on printing money is "working with consistently decreasing effect." He doesn't think that the Fed is going to raise interest rates for at least a few years. 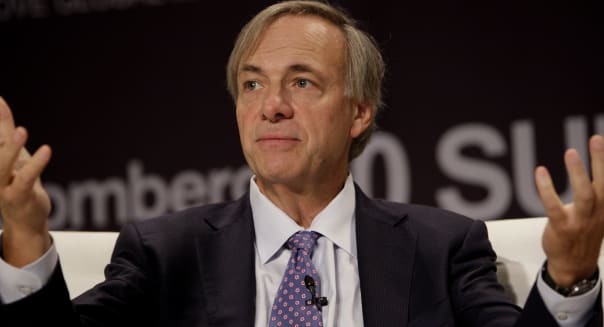 "Going forward, most investors are not going to be able to produce alpha," Dalio says, referring to the return of an investment in excess of its comparable benchmark index. He predicts that investors will move to a more balanced portfolio.